Versailles FFA members who competed in the county public speaking contest included (back row, l-r) Caden Buschur, Isaiah Hess, Haley Mangen, (front row, l-r) Delaney Barga and Tori Wuebker. 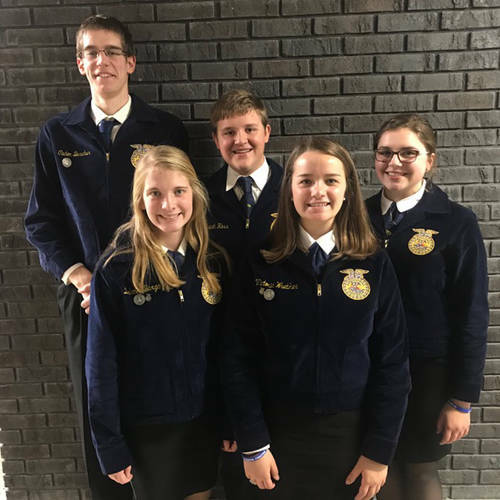 NEW PARIS – The Versailles FFA participated in the County Public Speaking Contest on Monday at National Trail High School. The Versailles FFA had five members participate in this public speaking contest. Isaiah Hess competed in the eighth grade member Creed Contest. In this division of the contest, members had to recite the FFA creed from memory and were asked questions at the end. Hess was given a Gold Rating for his creed. Freshman Delaney Barga participated in the Beginning Prepared division in which members recited a prepared speech from memory and answered questions about it. Barga placed second overall and will move onto the district competition. Junior Caden Buschur and sophomore Haley Mangen participated in the Advanced Prepared competition. In this division, the members prepared a six to eight minute speech and then were asked questions about their topic. Buschur placed first in this division and is moving on to the district competition, and Mangen placed second. Sophomore Tori Wuebker competed in the Extemporaneous Division. The Extemporaneous competition consists of the contestant choosing a topic when they arrive and getting exactly 30 minutes to prepare a speech. They then give their speech and are asked questions about it. Wuebker placed first. Barga, Buschur and Wuebker now will move on to compete at district in their division.